Springtime is never complete until we have my Mom’s Lemon Butter Bundt Cake. Your soul will be satisfied with a crispy, buttery bottom similar to old-fashioned buttermilk donuts. Kissed with the refreshing flavor of lemon, this is a must have this time of year. So delicious that we have had multiple stories of family and friends not being able to just stop at 1 piece and sometimes not stopping at 2 or more pieces. I will let your imagination do the job of unfolding what happened after that to save them the embarrassment of having these stories shared. This cake really is that good and imagine how hard it is to stop at one piece when you love lemon. For my family, cakes like this Mom’s Lemon Butter Bundt Cake were very common for us at Easter. My mom adored Easter so it doesn’t surprise me that she found one of the most popular old-fashioned bundt cakes and adjusted it with flavors our family loves. I don’t know where this recipe originated as it is written on an old piece of paper that has seen better days. Eating this brings back fond memories of a kitchen filled with the sweet smells of cake baking and joyful Easter Sundays eating it. Don’t be fooled by the center of the piece of cake as this bundt cake is fully baked. What you are seeing is the ooey gooey lemon butter glaze that oozes down into this cake. Proceed cautiously!!! I am being completely honest when I say people can’t stop at one piece because this Mom’s Lemon Butter Bundt Cake is that GOOD. I recommend buying about 6-8 larger lemons to yield enough zest for the cake. Be careful to not boil the lemon glaze ingredients. You will want to stir the ingredients over a medium/low heat just until the butter is melted and the sugar is dissolved. Make the glaze the minute you pull the cake out of the oven and while it is cooling. Once the glaze is made poke wholes on the top of the cake while it is still in the pan. Pour the glaze all over the cake and let it cool completely before removing. I used a large chopstick to poke wholes on the top of the cake. Once it is completely baked you may need to run a knife along the side to help the cake release. Invert a plate or cake stand and flip over using both hands. The cake should easily slide out onto plate. If it doesn’t, run a butter knife along the side of cake pan again. Once the cake is ready to serve dust with powdered sugar and serve with a dollop of whipped cream. For a bit healthier spin on this lemon cake from scratch, use grass-fed, pasture raised butter and pasture raised eggs. A completely satisfying cake with a crispy, buttery bottom similar to old-fashioned buttermilk donuts. 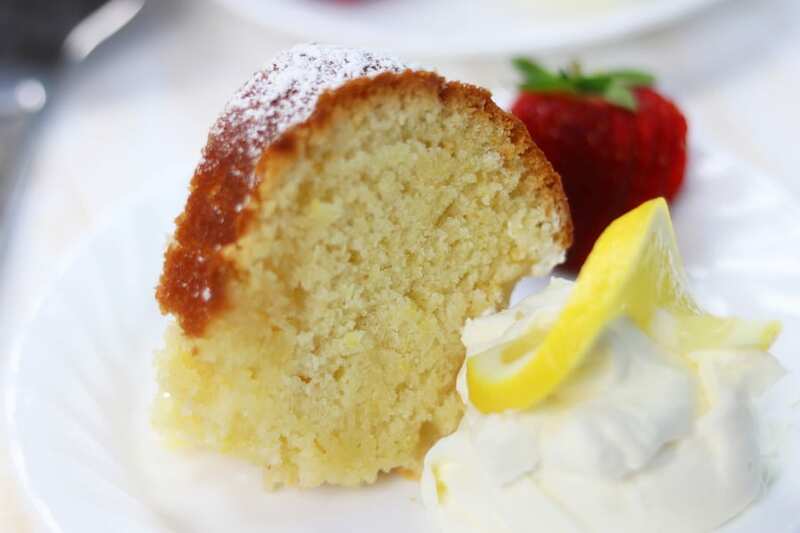 Kissed with the refreshing flavor of lemon, this is a must have cake. Preheat oven to 325℉. Grease a 10" bundt pan. 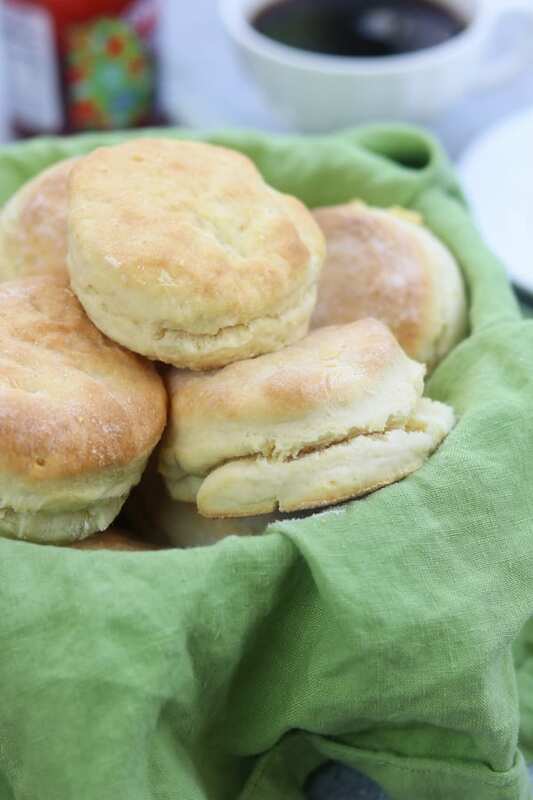 In a stand mixer cream butter & sugar until light and fluffy. Slowly beat in eggs one at a time, making sure to blend well. In a separate bowl sift together flour, baking soda & salt. Stir flour mixture into egg mixture a few spoonfuls at a time alternating with buttermilk. Begin and end with with dry ingredients. Stir in lemon juice and zest. 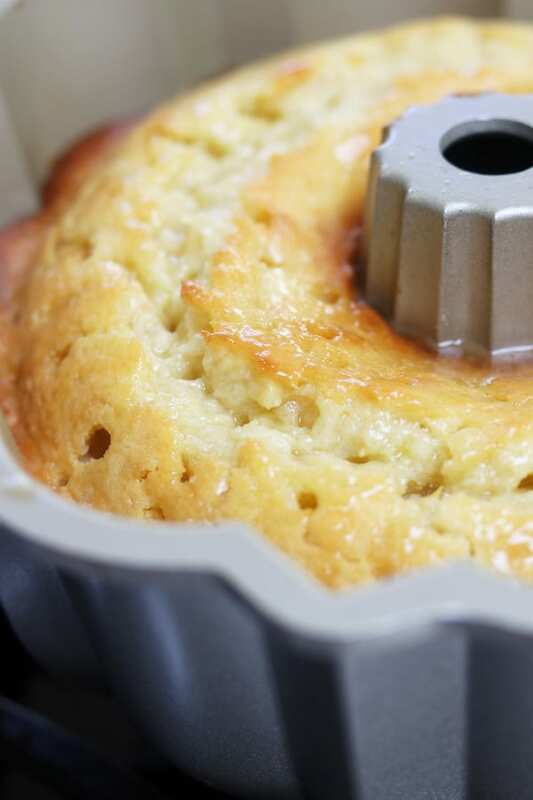 Pour batter into greased bundt pan. Bake on middle rack for approximately 1 hour and 5 minutes. Check at 1 hour marker. Cake is done when it pulls away from sides of pan and tester comes out clean. Once cake is out of oven immediately start glaze. Add glaze ingredients to a small pan and heat over medium low heat, stirring frequently until butter is melted and sugar is dissolved. Poke holes in the top of cake and pour glaze evenly over the top. Let cake cool completely before removing. Invert onto plate or cake stand and dust with powdered sugar. Should I ise room temperature eggs and buttermilk because the butter is at room temperature? Or it doesn’t matter to use them straight from the refrigerator? Hi Adriana, I have actually done both over the years of baking this cake and both turned out great. I usually remember to put the butter out the night before but often forget to put the eggs and buttermilk out a few hours before baking. If you forget, don’t worry, it still turns out great. This link may help a little also:http://www.thekitchn.com/do-cold-eggs-really-make-a-difference-in-baking-195280. I hope you enjoy the cake! Sounds amazing, my husband is a fan of all things lemon!! Thank you for sharing, i am going to try it this afternoon!! YAY! I hope you enjoyed it. I am right there with your husband, I LOVE all things lemon! Can you use regular all purpise fliur or will it change the recipe? I made this cake last night. It really was delicious, but mine was very dry. I am expecting that it was because I baked in a convection oven. I’ll do a little research to see how to adjust the baking time to account for that. I poked the holes with wood skewers and after pouring about 3/4 of the glaze it seemed like it was going to be too much. I saved it though, and when I turned the cake out I drizzled the rest of the glaze on the top of the bundt. Glad I did, because it did help a bit with the dryness. Will try this again and adjust for convection. The texture and flavor were AMAZING! I hope you have a wonderful weekend and by the way, I can’t wait to get my hands on a convection oven. Enjoy it! ???? Would love to try this but could you use regular milk instead of buttermilk? I have made two cakes so far with buttermilk and I must admit, didn’t care for either one. Not sure why buttermilk is used instead of regular milk in recipes. For this particular recipe it helps to keep the cake moist. I hope you get a chance to make it. Enjoy! Have you ever baked this in a 9X13 dish? or an 11×17 dish? I would be making 2 to serve 25. I thought it would be easier to serve. Just wondered if it needs the center of the pan to rise properly? This is a great question. Unfortunately I have only done it in bundt form. I have found recipes using boiling water for sheet cakes to usually turn out really moist and delicious. 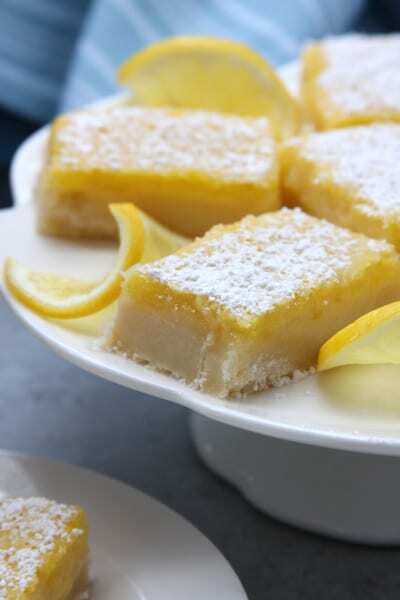 I haven’t tried this particular recipe http://www.food.com/recipe/lemon-texas-cake-346451 , but I am really intrigued by this one ???? I just baked this cake using my mom’s Meter lemons and it smells so good in my house right now. I am bringing this to a brunch potluck. I have no doubt that the cake will be devoured before the event is over. Waiting for to completely cool before turning it over is so hard! 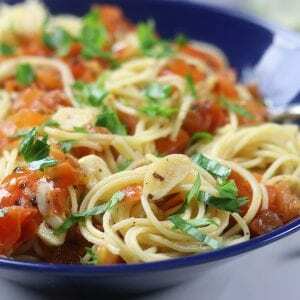 I am so glad I stumbled upon this recipe! I am so happy to hear. I am such a lemon lover that I completely understand loving the smell. I hope you enjoy! The glaze recipe doesn’t say how much of the zest you put in. Can you please let me know. Thanks. Thank you for reaching out. The zest is only for the cake. The glaze just has the butter, sugar and lemon juice. I hope this helps. Yep, 1/2 lb and as a warning, it defiantly has the potential of adding to waistlines but it is so yummy! Can you use salted butter and if so does it affect the amount of salt you add? Also, I usually make sour milk using lemon juice, would this be an appropriate substitute for buttermilk? I actually have baked with salted butter rather frequently because Costco in my area only has salted organic butter. I usually just forgo the salt when I do that and the baking still turns out great. However, I actually haven’t done it with this recipe so I can’t say with 100% certainty that it will be the same. Same goes for substituting buttermilk. I am anxious to here out it turns out. Please share as it will be very helpful for others. Enjoy! I have a question, I am always confused about sifting the flour . Do you measure the flour before sifting or after sifting? This is the best lemon cake I have ever had hands down! 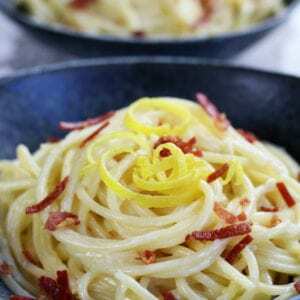 I love anything lemon and have tried many recipes. This one is the best! 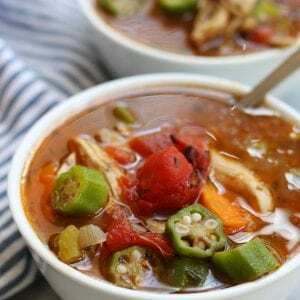 I cannot thank you enough for sharing this wonderful recipe. I followed your recipe and changed nothing. Oh Cindy that makes me so happy! Thank you so much for taking the time to share this. You just put a huge smile on my face! P.S. I love lemon too and very shortly I will be launching a whole citrus section but lemon is the #1 star. ???? 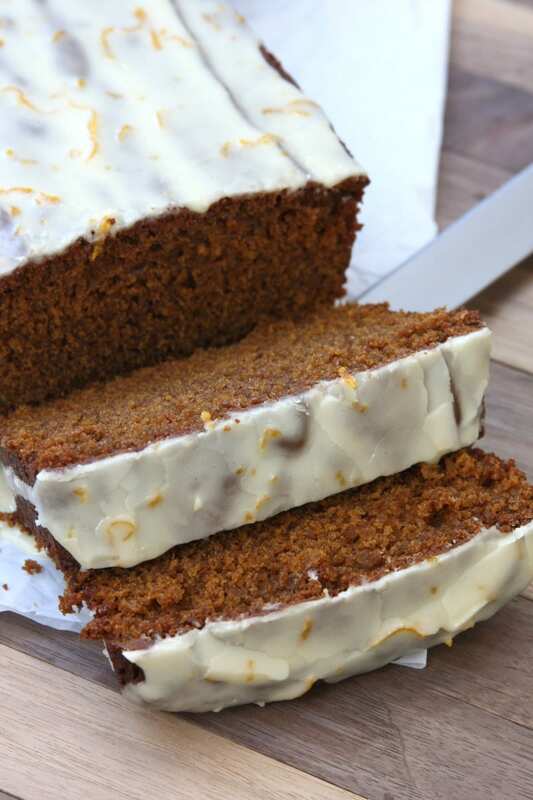 Soooo good – lemony and moist! Definitely a keeper! Yay!!! I am so glad to heat that. Thank you for commenting Valda! Honestly my best tip is to carefully run a butter knife along the edge just enough to loosen the cake from the side of the pan. With the bundt pan I used I could run it as much as I had to gently insert the butter knife in a downward motion between the cake and the pan. I hope this helps. I use a recipe for cake release that very seldom doesn’t perform wonderfully. 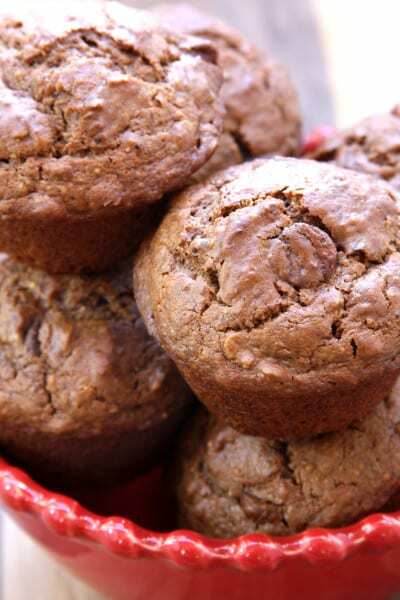 You isevequal parts of oil, flour, and shortening blended into a creamy mixture. I Spread it into the pan with a pastry brush. Usually things come right out. It can be kept in the fridge or the cupboard. Nothing in it spoils. That is very helpful Kelly. Thank you! I wonder if coconut oil would work as well as I don’t use shortening? Made this cake, but was disappointed. One of the ingredients was baking Soda. Here in Australia we have baking powder or bicarbonate soda………unfortunately I chose the wrong one, so it was a bit of a flop. I will try this again and will use bicarbonate soda next time………fingers crossed. I appreciate you sharing this with me as it will be helpful if this question comes up again from any of my Australian readers. 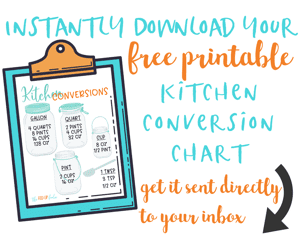 I write my recipes with my U.S. audience in mind so this is very helpful. Thank you! I have a Nordic bundt pan just like yours. My pound cakes always stick and come out in chunks. I have greased and floured well and still the same. I have tried everything. Any suggestions? That sounds so frustrating. I am so sorry you have to deal with that. Let me just first say I am such a huge fan of the old fashioned baking pans that weren’t nonstick but they are so hard to find nowadays (wow I sound old). To help release I carefully run the thinnest butter knife or utensil I can find along the sides of the cake. I have noticed that if I can loosen the cake and get some air between the cake and the pan it makes for easier release. Once I do this I invert the cake onto a large plate or cake stand and with the weight of the cake it usually falls out intact. Hopefully this helps. Please keep me up to date on wether this works. Lemon is only second to chocolate in favorite desserts at our house. This glazed lemon cake is perfect for my family!! That makes me so happy Liz! I am such a lemon lover myself!! This has the perfect balance of bright lemon and that sweet dairy butter flavor! Thank you Joanne! It is so yummy when you are a lemon lover. Those photos are making my mouth water! I definitely need to bake this! Yay! I hope you love it as mush as my family does! Bundts hold a special place in my heart and this lemony deliciousness is seriously calling my name! It is so hard to stop at one piece too????. I hope you enjoy! The texture of this cake is just perfect! 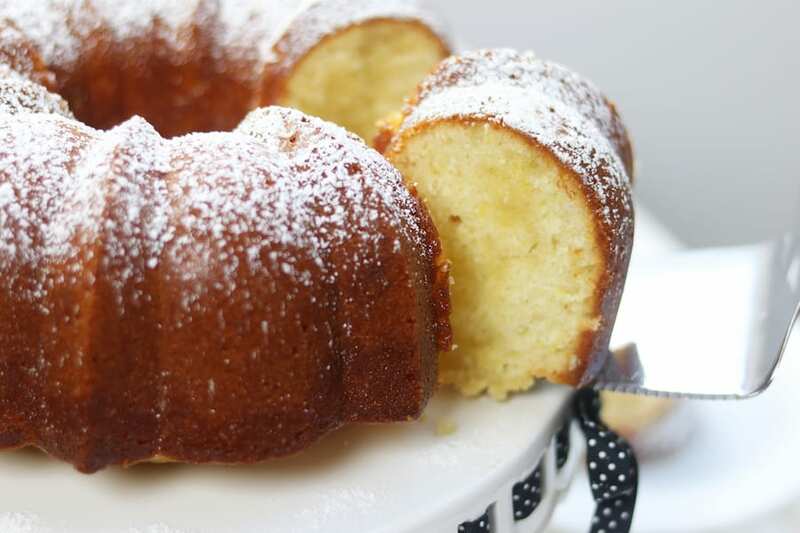 This is the most perfect bundt cake- so delicious! Thank you Lori! We love it too. I need this delicious sounding cake in my life!! Oh my, me too! This cake just makes me happy! I love a good lemon butter bundt cake, can’t wait to try it! I made this when I needed buttermilk for a different recipe and knew I’d have a lot left over (why are the containers so big?). And oh my gosh, I think it has turned into my one of our favorite desserts. It was SO good. My husband said it was his favorite lemon dessert ever, and on top 10 list of all desserts. We can’t stop eating it. I substituted half of the sugar for a sugar substitute as my husband’s diabetic but it worked out just fine. And I only used about 3/4 of the glaze. I’d like to try making it again and freezing it, do you think that would turn out well? Thanks for the great recipe. I’ve already shared it with a friend. Oh my goodness Gretchen I completely feel the same way about buttermilk. The container is just too big!!! lol!! I am so happy you love the cake. We literally have a hard time stopping too. You have made my day sharing your results. Thank you!!! Do you put lemon zest in the glaze? I see in the notes you say that 6-8 lemons would be good for the cake and the glaze. I just see lemon juice for the glaze. Hi CJ! That was actually a typo in the tips section that I corrected. Thank you for pointing it out. However, lemon zest in the glaze would be incredibly tasty. I made this cake exactly to the recipe and it was the best lemon anything I have ever eaten. My husband gave it a 9.5 out of 10. This is the cake he wants made for his birthday coming up soon. Oh Debbie this makes me so happy to hear! It really is a favorite in my family so I hope it becomes one for yours too. I made this cake yesterday. Very lemony and good. I followed directions exactly except used bleached flour. I had no problem getting the cake to release but had gone thru lots of steps to eliminate problems (greased pan plus sprayed with PAM and used knife around edges before attempting to release). Next time I will try just spraying pan because the knife damaged some of the outer edges. I have found that cakes taste better the second day so am anxious to see if a great cake can get any better . Thank you for the recipe. FYI – I freeze leftover buttermilk in one cup containers. It looks a bit different when defrosted but works just as well. I am so glad you liked it and I hope it tastes even better the next day! I LOVE the tip about the buttermilk. That is brilliant!! I get so tired of throwing away buttermilk because I couldn’t use it fast enough. Heather, the cake was not only better the next day it was outstanding! When preparing for guests I always make the dessert a day early. It really improves if it sits for a day. We had unexpected guests last night and they all LOVED the cake. Thank you again for sharing. I can’t even tell you how happy this makes me! I truly appreciate you taking the time to not only make the bundt cake but also taking the time to let me know how it turned out. Thank you so much! Hi. 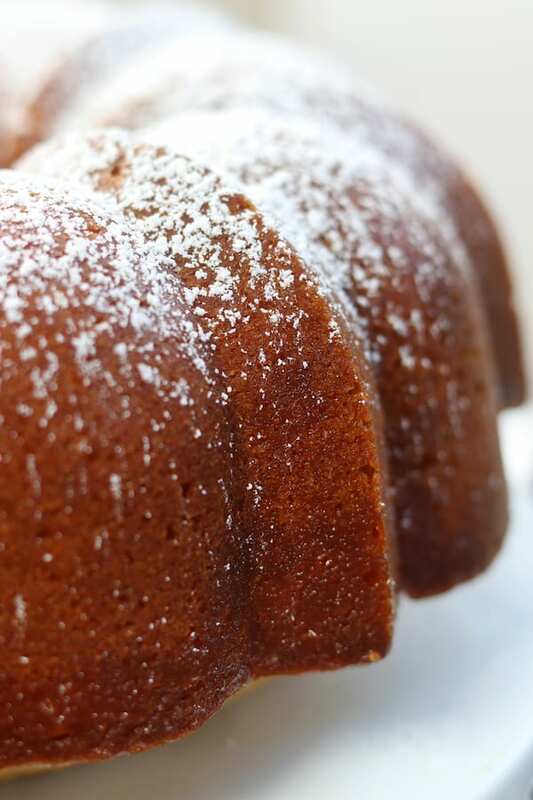 Do you pour the glaze on the cake while it is still in the bundt pan? Before inverting it onto a cake plate? Hi Phyllis! Yes, you are exactly right. The glaze goes on while the cake is still in the pan. Can you add poppy seed to this cake? I haven’t actually tried but it sounds amazing! Please let me know how it works out if you give it a try. Just a word of warning, this recipe creates quite a tender cake. While the texture is really nice and soft, it isn’t suitable for using in mini bundt tins, as the structure isn’t robust enough. America’s test kitchen does a much stronger cake which is suitable for this use. The addition of butter to the glaze in this recipe is great, and adds another level of decadence to the cake! Thank you Nina for your review. Hello! I will make this cake for my daughter birthday on saturday! But I have to do so many things that I want to bake it today an served it satuday, is that ok? What is your recommendation? Thanks in advance. To ensure optimal freshness I wouldn’t prepare the cake any sooner than tomorrow. Honestly, every time I make this cake it disappears so quickly that I haven’t had it past the 2 day marker. I hope all the preparations go smoothly and you have a wonderful time! Thank you for the recipe! 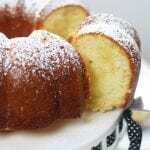 It is a delicious bundt cake, what is really awesome is that you can keep it for several days. And the taste gets better and better. You are very welcome and I am so happy to hear that! It such a favorite at our house that we can never stop at one piece.